[wp_ad_camp_2]Here it is, by popular request, a series on stop whistle training. There are several ways to teach the stop whistle, this is mine. As always you will be very welcome to add comments and suggestions. I aim to take you from a dog that has no knowledge of the stop whistle, to a dog that will stop at fifty yards away ready to take further directions from you. Once we get to this point, all you need to do is stretch out the distances to suit your own requirements. Today we’ll look at the principles of stop whistle training. The stop whistle is arguably the most important command your dog will ever learn. It enables you to help the dog when you know something he doesn’t, to prevent him from getting into danger, and to select what he retrieves, and what he leaves. 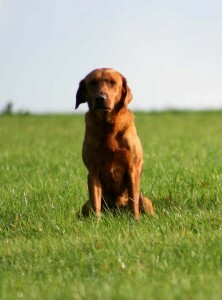 The stop whistle is also a precursor to all the other stop cues that we want the hunting dog to obey, such as the shot. and the fall or flush of game. The stop whistle has great potential for being an ‘unpleasant’ command in the eyes of your dog. Stopping is the complete opposite of what the dog wants to do. From a his point of view, whether he is hunting or retrieving, the last thing he desires is to come to a standstill. Whether he is intent on flushing a pheasant or retrieving a rabbit, there is no way your dog will see the point of ‘stopping’ unless you help him to. Your job is to make sure that your dog does not perceive the stop whistle as a negative thing, and to make the stop whistle ‘fun’. It is a challenge, but it isn’t as hard as you might think. The recall has equal potential to be an unpleasant command, but because it terminates at your hand, you always have opportunity to reward the dog in a generous and very timely manner. The working dog in the action of stopping however, is usually not within reach and so we have to look at other ways of rewarding the dog for the desired behaviour. The reward for stopping the dog at a distance is either the opportunity to retrieve, or the opportunity to hunt on. Either of these behaviours are highly desirable to the dog. Your first job is to teach your dog an automatic stop at close quarters so that you have a chance to show him how rewarding a stop can be, before you stretch out the distances between you. With the dog at your side you have additional opportunities for reward using food. Many traditional trainers don’t use food rewards, but I have found since I introduced these in early stop whistle training, that I don’t have to correct the dog so often. The stop whistle process begins with teaching the dog to ‘sit’ to a whistle. Later on, if you want to, the sit can be reduced to a simple standing stop. Some trainers prefer this. Initially though we expect a full sit. Food rewards make it easier to get a ‘faster’ sit, as you can selectively reward the faster sits and omit rewards on the slow ones. Because much of this training programme relies on retrieves to reward the dog, you need a dog that both enjoys retrieving and that is steady to fall. If you have not yet steadied up your dog check out this article: Introducing steadiness to fall.